Be the first to share your favorite memory, photo or story of Sally . This memorial page is dedicated for family, friends and future generations to celebrate the life of their loved one. 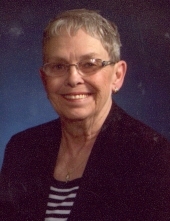 Sally Ann Sjobakken age 75 of New Hampton, IA died Sunday, April 14, 2019 at Linn Haven Rehab and Healthcare in New Hampton. A Memorial Service will be held 11:00 a.m. Thursday, April, 18, 2019, at Hugeback Johnson Funeral Home & Crematory in New Hampton with Rev. Kevin Frey presiding. A private family inurnment will take place at a later date. Friends may greet the family 9:30 - 11:00 a.m. on Thursday prior to the service at the Funeral Home. Sally Ann Sjobakken was born November 16, 1943, in Minneapolis, MN, the daughter of A.J. and Grace (Treat) Schnurr. She attended school in New Hampton and was a 1961 graduate of New Hampton High School. Sally began her career working for A & P Produce in New Hampton. She worked for the company for several years. Sally met the love of her life, Paul Sjobakken at the Sweet Shoppe in New Hampton. They were married on August 6, 1966, at St. Mary's Catholic Church in New Hampton. Sally and Paul were blessed with two children; Jon and Julie. While the children were small Sally did the most important job in the world, raising her family. When they entered grade school she spent many years as a school volunteer and working in a daycare. While Paul was on the road she also spent time working in retail sales. The family moved to Waterloo in 1974 living there for 32 years. The family moved back to New Hampton in 2006. When returning to New Hampton Sally spent her final working years revitalizing the Chickasaw Event Center. Sally had a passion for raising flowers and always looked forward to summers spent tending to her garden. She enjoyed fishing in local waters and making an occasional trip to the local Casino. Sally was the definition of love and kindness and would do anything for her family and friends. Sally is survived by her husband of 53 years, Paul Sjobakken of New Hampton, IA; son, Jon Sjobakken of Ames, IA; daughter, Julie Sjobakken of Waterloo, IA; four grandchildren; brother, J.C. (Tammy) Schnurr of Surprise, AZ; two sisters, Jane Kraft of New Hampton, IA, Leslie (Ron) Bumba of New Hampton, IA. She was preceded in death by her parents; brother-in-law, Dave Kraft; niece, Amanda Bumba. To send flowers or a remembrance gift to the family of Sally Ann Sjobakken, please visit our Tribute Store. "Email Address" would like to share the life celebration of Sally Ann Sjobakken. Click on the "link" to go to share a favorite memory or leave a condolence message for the family.